NBN's disconnection flaw - jxeeno blog. As the NBN gets rolled out across Australia (well, it was anyway), an agreement between Telstra and NBN Co means that the Telstra copper network will progressively be turned off 18 months after a Fibre Serving Area Module (FSAM) is marked as being "ready for service". The problem with this system is NBN Co's classification of "ready for service" — being an area where at least 90% of the premises are considered passed1. In reality, while the premises are passed, homes and businesses placing may not be able to order a service as such. This is especially prevalent in apartment blocks, units, duplexes and shopping complexes or "multi-dwelling units" (MDUs) where additional network design and construction work needs to be conducted before a service can be ordered. This is known as the 'Service Class 0' issue as these premises are classed as Service Class 0 — being passed but not serviceable or able to obtain a service yet. So, there may well be an 18-month window between the "Ready for Service" date and the copper switch-off — but for some unlucky residents and business owners, it may turn into a state of limbo where Telstra cuts services to premises which can not migrate to the NBN. However, we won't know how this will play out until the first batch of disconnections happen later this year in May. But the issue extends further than the 'Service Class 0' problem. 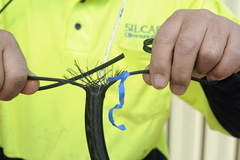 NBN Co has also been facing issues such as broken lead-in conduits. The actual installation and pull in of NBN fibre may takes weeks or even months of awaiting remediation work by the civil works team. NBN Co has been addressing this issue with the "build drop" then the subsequent "bulk drop" rollout schemes. Essentially, the "bulk drop" is a separate build process where contractors conduct the lead-in work for all premises in an FSAM at once. This usually happens before or just after an area is classed as "ready for service". 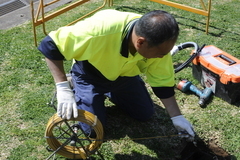 A special team of NBN Co contractors would pull fibre through the ducts of all houses in the neighbourhoods and install the "NBN Utility Box" (also known as the Premises Connection Device — PCD) on the exterior of all premises. This would speed up the process and make the ordering process much simpler with the NBN Co technician only needing to install the internal fibre and NTD. At least one FSAM has undergone this mass PCD installation process (Gladstone Park, VIC) with over 1,000 PCDs installed at end user premises at only 3 weeks in after the Ready for Service classification with another 800 premises which should be connected in the coming months. So it seems that the most challenging part of the rollout is the next 3 months with the transition from copper to fibre for some 27,000 premises. There will be problems, no doubt. And there will be intense media scrutiny. And of course, no doubt — our Minster of Communications will become the Minister of Blame-everything-on-Labor-for-their-mismanagement. Perhaps it was a bit ambitious to do it all in 18 months, but these are growing pains for an inevitable transition… regardless of what our home-grown the inventor of the Internet says.